1964 Supply Co.'s phenomenal OG Kush cultivar is as regal and decadent as they come. 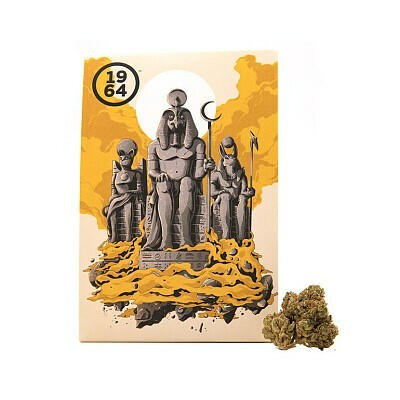 1964 Supply Co. invited artist Joe Wilson to indulge in OG Kush and create. His awesome artwork and words combine to paint a wonderfully intoxicating mindscape, "This is the 'Original Gangster' Kush strain that has a lineage like no other. Go from stressed out to rolling like an Egyptian God. They're as OG as it gets." Want a pyramid built in your name? 1964 Supply Co.'s OG Kush cultivar has you covered. Each package contains either 1 gram or 3.5 grams of this dense bud, pre-packed and sealed for optimal freshness, your highness. Indica dominant.